Primarily a 2-D artist, I work in a variety of media including colored pencil, pen and ink, screenprint, watercolor, and photography. Mostly satirical in nature, my work uses simple visual constructions to investigate complicated social themes. In a political climate that is increasingly divisive, in which many people feel perfectly at ease with their own ignorance and indignation, I am interested in asking questions of the viewer, reminding us of our shared humanity (for better and worse), and encouraging us all to look for more nuance in the world around us. As an illustrator and graphic designer, I have worked on a great variety of projects, from t-shirts for bands to website design, from editorial illustration to commercial branding. 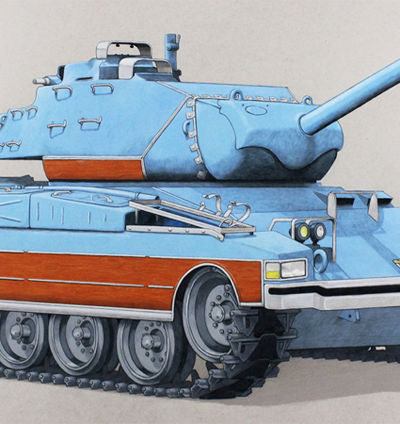 Caprice Classic, colored pencil on paper, 42 x 52"